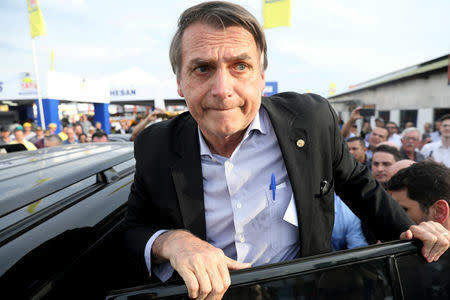 SAO PAULO (Reuters) - Brazil's far-right presidential candidate Jair Bolsonaro, in intensive care after being stabbed at a campaign rally, kept his first-round lead in an election opinion poll on Friday, but a leftist rival from the Workers Party (PT) made solid gains. The knife attack against Bolsonaro last week has further complicated Brazil's most unpredictable election in three decades, with its most popular politician, jailed former president Luiz Inacio Lula da Silva, banned from running in the Oct. 7 vote due to a corruption conviction. Lula's hand-picked successor to stand for the PT is former Sao Paulo mayor Fernando Haddad, who jumped to 13 percent of support in Friday's poll, up 4 points. The poll indicates the PT's strategy of transferring Lula's massive appeal to the relatively unknown Haddad is bearing fruit. The party's campaign rolled out advertising this week with the simple message: "Haddad is Lula." Lula's backing is expected to propel Haddad into a likely Oct. 28 runoff vote, required if no candidate takes a majority in the first ballot. But the polarizing nature of Bolsonaro means he has the highest rejection rate of all contenders, holding even at 44 percent on Friday. Haddad's rejection rate is 26 percent, up 4 percentage points from Monday. Support for center-left candidate Ciro Gomes, a former governor of Ceará state in Brazil's poor northeast, stayed even at 13 percent.